Perform mitigation analysis. For example, if you want to understand effect of mitigation efforts for a group of risks on project cost. To compare pre and post mitigation schedules, you perform an analysis without mitigation efforts and save the results as a baseline. Next, apply mitigation efforts, this can require additional tasks and costs and reduces the probability or impact of the risk in the current schedule. Calculate the post-mitigation schedule analysis and create another baseline with these results. Finally, perform a cost comparison between the pre and post mitigation baselines. You can create baselines using the results of probabilistic schedule analysis. To do this when you create a baseline, you select a percentile on which to create the deterministic schedule. This creates a deterministic schedule with the results of the risk and uncertainty calculations built into it. RiskyProject presents “waterfall diagrams” for each risk. 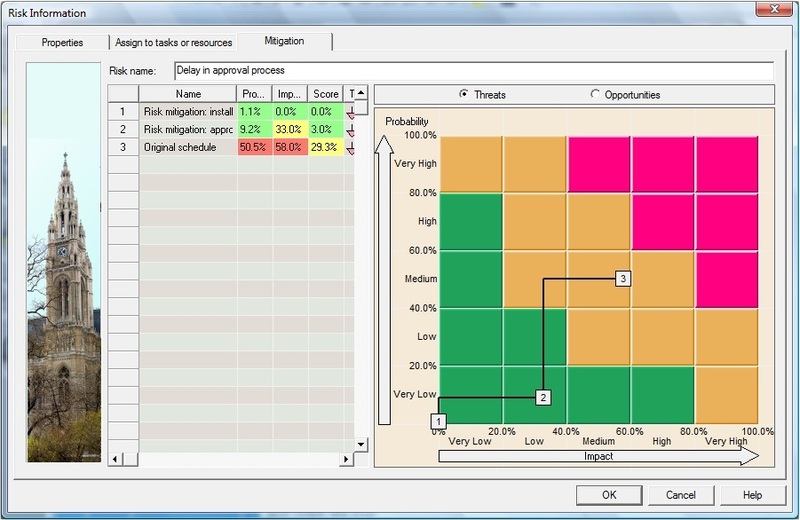 The “waterfall diagram” is accessible through the Risk Register.